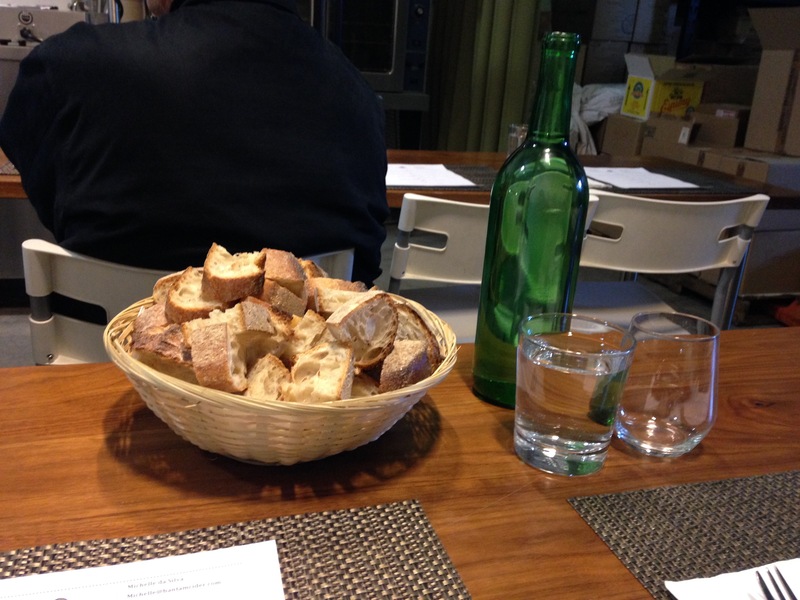 A few weeks ago, Noah and I went to a Formaggio Kitchen class. 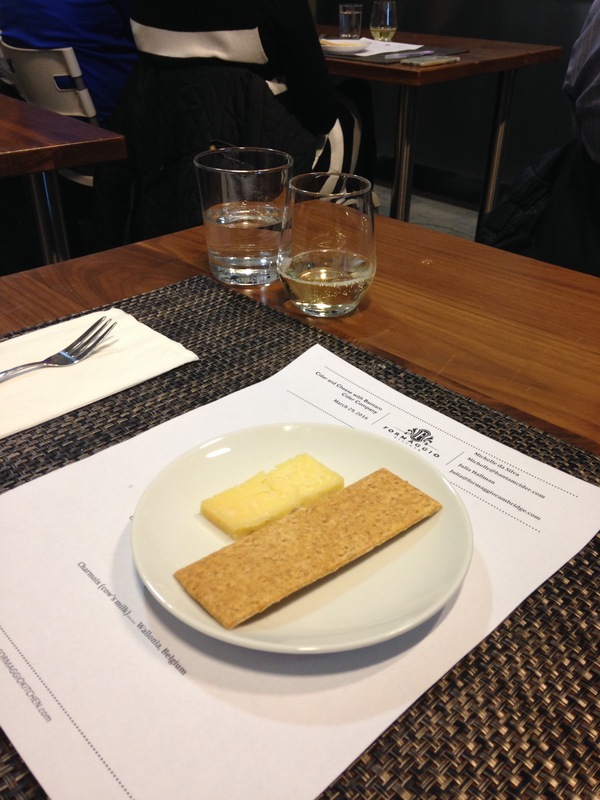 Formaggio Kitchen is a luxury food store (specialty in cheese) in the area, and they offer cheese tasting classes that often include wine pairings/tastings or other special ad-ons. The classes fill up fast, and Noah and I had to reserve our class months in advance! 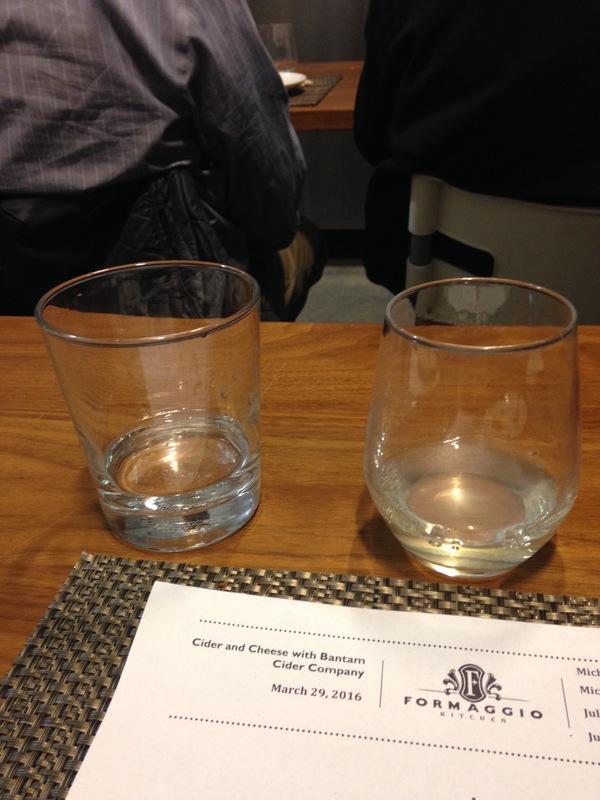 We signed up for a cheese tasting class done in partnership with Bantam Cider – a local ciderhouse that focuses on making fresh, all-natural ciders. The first cheese was a clothbound cheddar (from Cabot in Vermont! 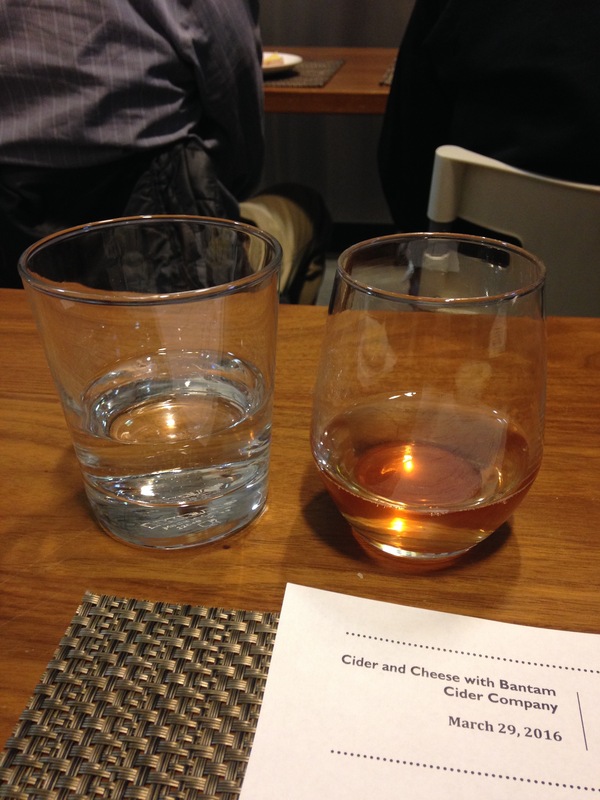 ), and it came paired with Bantam’s classic cider – Wunderkind. 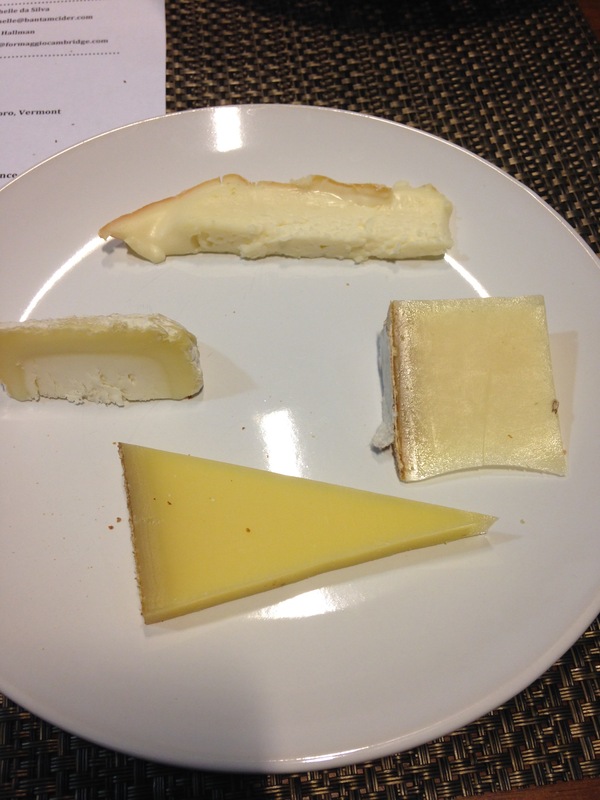 After round one, we received a plate with the next four types of cheese: a grand cru, comte, chabichou, and charmoix (pictured below, clockwise from the top). 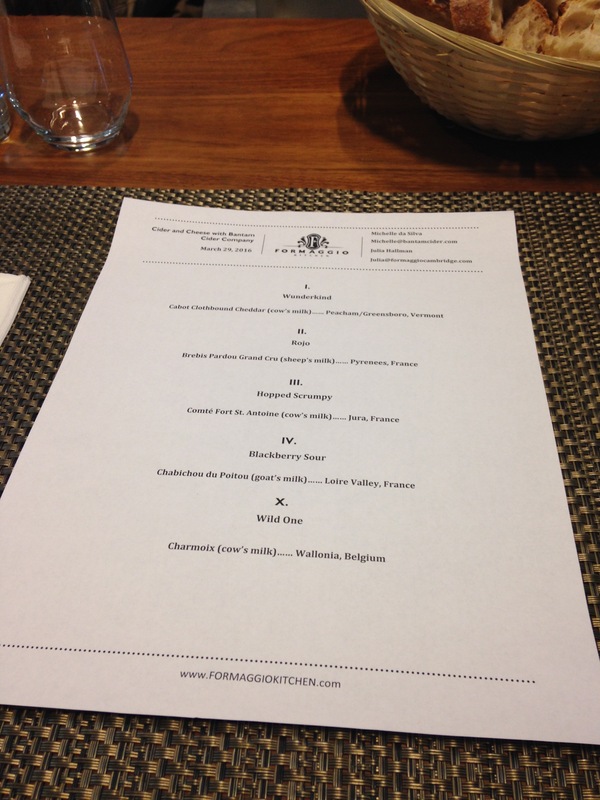 Each of the cheeses came from a particular fromager that the buyers from Formaggio Kitchen have a relationship with. It was fun to hear the stories about the buyers building relationships with different farms, producers, and fromagers. Each cheese was paired with a different cider, and the various tastes were supposed to complement and enhance one another. In order, the ciders were Rojo (aged with sour cherries and black peppercorns), Hopped Scrumpy (added hops towards the end of the fermentation period), Blackberry Sour (tart blackberries give it a sour/fruity taste), and Wild One (a funky cider that is open-fermented with wild yeasts, also a bit sour). 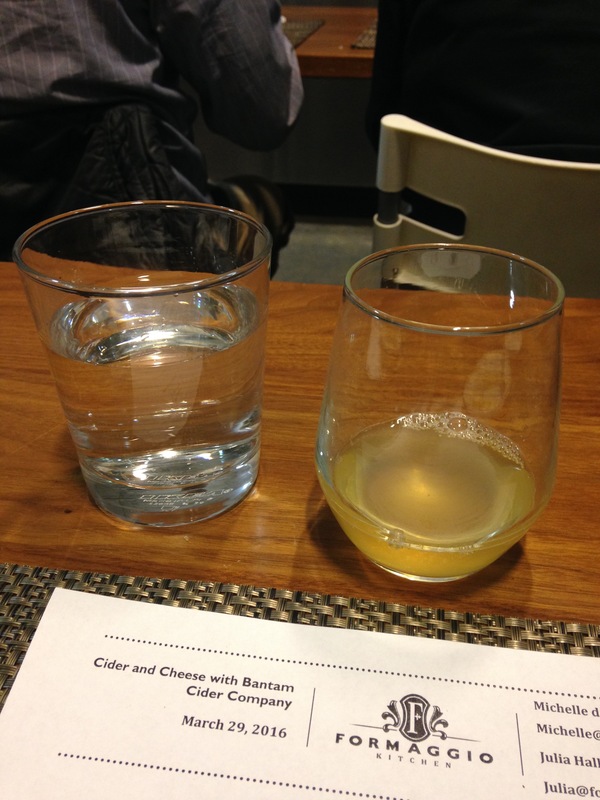 Michelle da Silva, one of the founders of Bantam, was also at the class, and she provided lots of information about the cider-making process as well as the specifics of each cider. 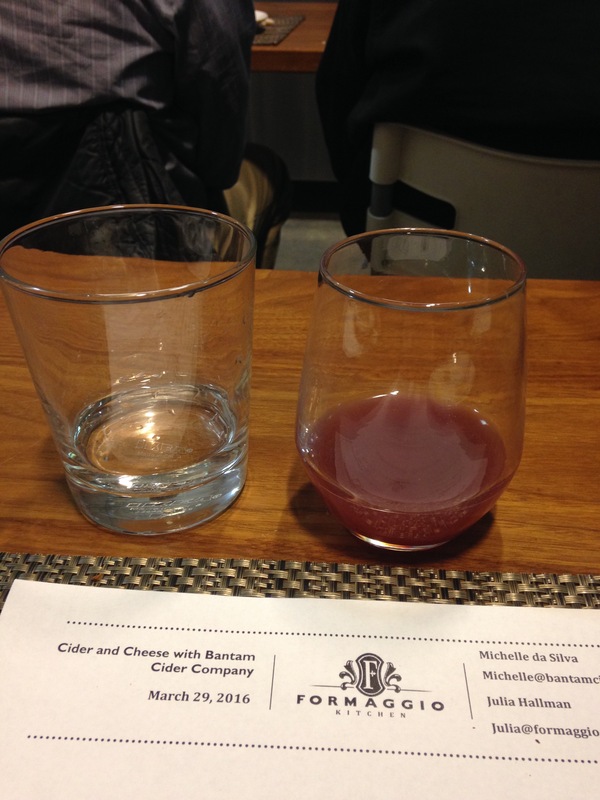 The evening was fun and informative, although I think I am not a sophisticated enough cheese eater or cider drinker to have fully appreciated the benefit of the pairings. I’m definitely glad we went and it was a fun date (the sort of thing that would be an ideal gift for a cheese/cider/wine fan), but it was a bit pricey and I don’t anticipate going to another class. We were, however, inspired to make a trip to the Formaggio Kitchen store recently where we bought some fresh mozzarella for Noah to try on his pizza masterpieces.